Landmark buildings define a city skyline, recognized around the world as the city’s identity. One foggy morning I was on the way with my architecture class to our project side of Marzahn. Sitting in the bus seemingly lost in the hazy morning, I looked out at the seamless architecture as one building blended into another in the distance. One structure stood out. I just could not take my eyes off the sphere apparently floating in mid air on its thin column. Rising into the sky like a raised hand in a class of students, trying to grab the attention of their teacher, going higher and higher than the rest—the Berlin Fernsehturm. In Berlin’s tumultuous political history of ideologies attempting to compete and outdo each other, constructing and conceptualizing an identity to showcase the DDR’s technological advancement and superiority became necessary. Walter Ulbricht, the then leader of the Socialist unity party, decided to combine this with a practical need, broadcasting, and give East Berlin and the Socialist governance a highly visual symbol of their supremacy over the West. The earlier plan to locate the tower in Müggelberge was dropped due to the planned operation of nearby Schönefeld airport and the building was constructed in Alexanderplatz, where it would also be visible from West Germany. Henselmann’s original design was slightly modified by architects Fritz Dieter, Günter Franke and Werner Ahrendt, and features a spherical crown and swooping concrete shaft. 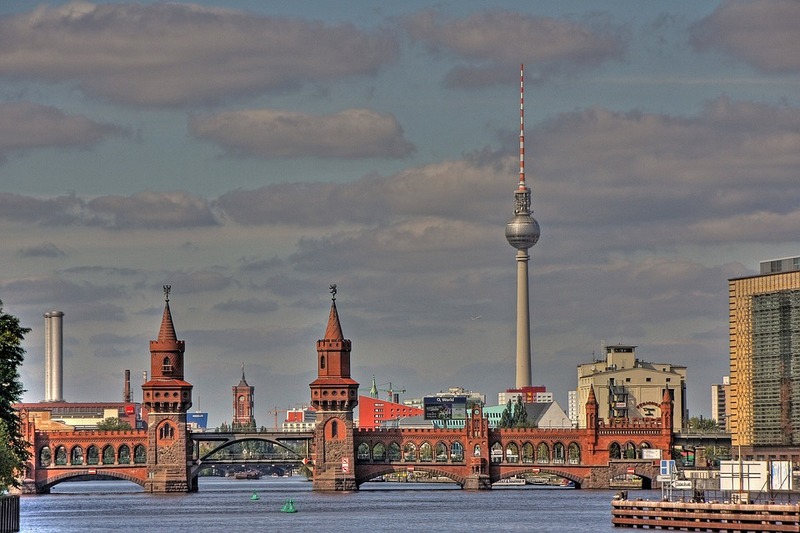 After four years of construction, the tower was inaugurated on October 3rd 1969, the National Day of the GDR. The height was intended to be 365m, for easy memorization like the days in a year, but after a 1997 renovation it now stands at 368m. The tallest city tower in Germany, it features the highest bar and restaurant above the observation floor. 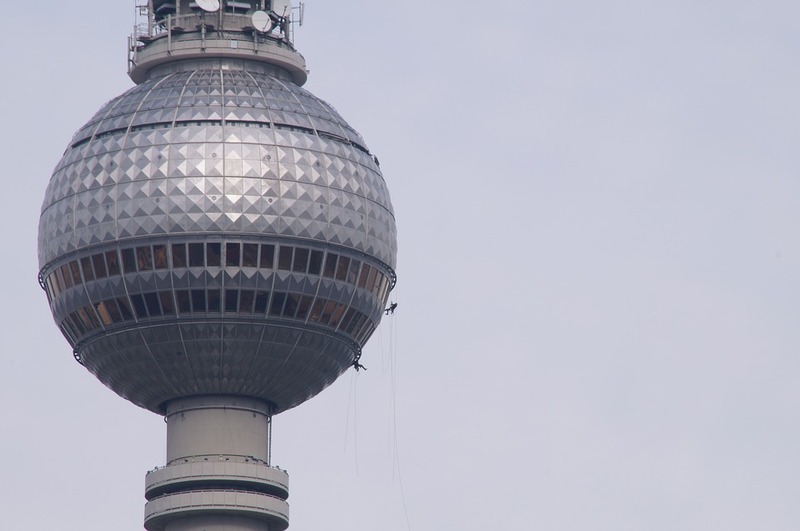 Most Berliners have mixed feelings about the TV tower, and as the saying goes, “Beauty is in the eyes of the beholder”. But the tower’s iconic omnipresence is one thing that is unquestionable. The closer the proximity to the tower, the sheer enormity of it dwarfs a person, while further away the structure behaves more like the North star to lost sailors--a guiding beacon that lends a sense of direction in the spiderweb of streets of Berlin. In fact, on many errands of mine in the city, I've realized that instinctively when I couldn't use my GPS maps I would try to locate the tower in the distance to chart my course of movement. On a clear day, the structure is visible up to fourty-two kilometers away in the areas of Kreuzberg, Wedding, and Charlottenberg. Visitors to the tower will have to be early as there is a constant throng of people trying to push their way into the belly of the giant. The lifts ride to 200m and the first platform at 203m offers a panoramic view of Berlin and the next level seven meters up hosts the restaurant. The tower still functions and broadcasts many channels on its seven floors. The only design feature the architects did not or possibly could not anticipate was the reflectivity of light on the stainless steel façade of the sphere. The Communist government had tried to remove crosses from churches to show their advocacy of a secular government, yet ironically the drama of light reflected on the sphere usually appears like a cross, nicknamed “Rache des Papstes” or the "Pope's Revenge". Despite many efforts to nullify this effect, it remained and was declared by the Socialists as a giant plus sign for Communism. The design of the complex’s lower parts draws parallels to the Japanese art of folding papers, Origami, in its angled and upwards slanting points and jutting down corner roof sections. Walking on the balcony surrounding the building I could feel these roofs defining new vistas for my eyes at each corner: directing my view towards the St. Marienkirche church, and then two downward slopes defining an entrance to Menschen Museum from the adjacent plaza and cafés. Once created to showcase East Germany, the Fernsehturm has stood the test of time and is now a symbol of reunified Germany, its silhouette representing Berlin and providing a geographic anchor for us.